If you are an existing FireStick user or planning to buy one, this is the only resource you will ever need. In this guide, I will take you through every single trick that you might need to stream movies, Live TV, shows, sports or other stuff. Amazon FireStick is a small, yet incredibly useful media device, which instantly converts any regular TV into a smart TV. It plugs into the HDMI port of your TV and lets you stream your favorite content over Wi-Fi. FireStick is a portable device that you can slip into your pocket and carry it everywhere. As long as you have access to a TV with HDMI input and Wi-Fi, you can use FireStick anywhere you want. FireStick is a cost-effective way to open up the whole world of streaming possibilities to you. The latest FireStick 4K costs $49.99. The new device incorporates 4K streaming capabilities, a significant upgrade from its predecessor which only offers Full HD (1080) streaming. FireStick runs on a modified version of the Android operating system and uses Amazon Store as the official app store. There are dozens of apps and games to download and use. Besides the popular, subscription-based entertainment services like Netflix, Hulu, Prime Videos, FireStick also gives you access to unlimited free streaming through third-party apps and Kodi media player. FireStick allows you to easily sideload third-party apps not found on the Amazon Store. Bookmark this page to always stay up to date with the latest developments on FireStick, Kodi, and other streaming apps. Plug your FireStick into the power source and connect it to your TV through the HDMI port. Allow it to power up. If this is the first time, the device will run you through a simple set up process. You will need an Amazon account and Wi-Fi for the setup. You can learn the whole set up process using the link below. Now that your FireStick is ready, the next thing you would want is to start watching free movies, TV shows, Sports, and other content of your choice. So in the next part of the article, I will be sharing interesting guides to supercharge your FireStick. Keep reading! Most of the users jailbreak their FireStick for streaming free content on their device. The “jailbreak” term here is nothing like playing with your hardware but just installing an app named “Kodi” which is not available on Amazon App Store. So, rest assured that jailbreaking your FireStick is totally safe and won’t void the warranty. You may use the link below for easy to understand step-by-step guide. Before you start using your Jailbroken FireStick, I would like to warn you that you must use a good Fire Stick VPN so that your streaming activities remain private. Your Government, your ISP and even certain third-party entities might be keeping a track of all your online activities (including the ones related to FireStick usage). When you jailbreak FireStick or use third-party entertainment apps for free streaming, you may land in legal troubles. Even though I never condone the streaming of copyrighted content, I strongly believe your Privacy must never be compromised. Therefore, I recommend using a VPN. I use ExpressVPN on my streaming devices and I suggest you do the same. You can install it quickly using the link below. I believe that you have jailbroken your FireStick with Kodi following the link above. But you must know that Kodi is a media player, with no content of its own. However, with Kodi addons and builds, you open yourself up to endless streaming possibilities on FireStick. You only need addons to start streaming your favorite content. Kodi builds are non-essential, but recommended. A build enhances your experience with a visual upgrade to the interface and by adding more interactive elements to the interface. Builds typically also come with pre-installed addons. The top-rated builds stay up to date with the latest and popular addons. Sometimes you may face issues with Kodi. In that case, below are some resources that might come in handy. To take your Kodi experience to a completely new level, I recommend signing up for Real Debrid. This service adds dozens of high-quality, premium streaming links when you request for the video playback. These links offer Full HD streaming and have the highest playback success rate. Real Debrid is the best multi-hostor for Kodi and makes sure you encounter the least amount of buffering while watching your favorite video. 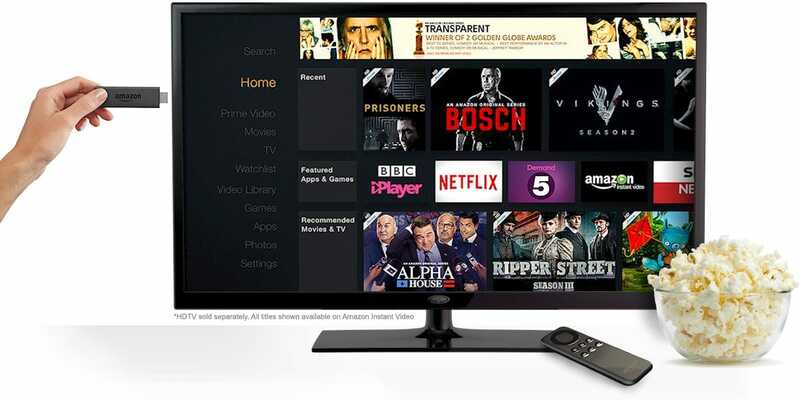 There are plenty of apps for high-quality streaming on the Amazon Store. FireStick also lets you subscribe to various channels or opt for pay-per-view streaming. That’s great. But, that costs you money, sometimes a lot. There are plenty of apps out there. However, not all are suited for FireStick. There are only a bunch of Android apps that adapt themselves to the TV screen. For a good experience, the app must be remote-friendly. Cinema APK (HD Movies) – This app has rapidly moved up the ladder and is possibly the best free streaming app in town. Titanium TV – Known as the Terrarium TV clone, this app lets you watch all your favorite movies and shows for free. TeaTV – The most popular successor to Terrarium TV, this app is meant for your streaming delights. Here’s our list of all popular and best FireStick Apps for you to try. Fire TV Stick 4K: The most recently released in the Fire TV Stick line-up, this 3rd generation device supports 4K (UHD) playback and the all-new Alexa Voice Remote. Fire TV Stick (or simply FireStick): This second-generation streaming device continues to be the most popular in the Fire TV series. Fire TV Cube: Equipped with Echo Dot and Far-Field Voice Recognition, Fire TV Cube is the most advanced of all. Not only does it make for an incredible entertainment experience, it also proves its utilitarian value by letting you control all your smart appliances at home with your voice. So, here is everything you need to get started with your FireStick. I would love to hear from you. Let me know how has your experience been with FireStick via the comments section below. Hi Gary, can’t place that app anywhere. What did the app do? Hi, yes, Ethernet may offer faster connection. However, if your router is set up close to FireStick, you may not notice any significant difference. Moreover, you will need to buy the Ethernet adapter for FireStick separately. Thank you for getting back to me. I will do jailbreak but wonder how much paid subscriptions will be. I might have to get back to you for help when I start the process. Hi J, subscription prices vary across services, however, most of the apps/addons shown in the guide above are completely free. Please feel free to get back to us whenever you need any assistance. I can’t find on any jailbreak sites exactly what apps you can get when you jailbreak. I want things like STARS, NETFLIX, HULU, etc, etc. that is why I got fire stick. I can continue getting them on my cable for a smaller fee. I want to get rid of cable and just use fire stick. What is more economical? And, can I get all of those streaming sites with fire Stick? IE. I watch Outlander on STARZ. FireStick is certainly more economical. You can still download the streaming sites you mentioned, but you will need paid subscription to watch content.